What is the lowest molecular weight hydrocarbon that is chiral? (A couple of restrictions — isotopes don’t count, so no deuterium or 13C, and no conformational stereoisomers, I’m looking for stable enantiomers at room temperature). This all came about because of a question I used on an exam I wrote a few years ago for an undergraduate organic chemistry class. My intention was to ask the same question on the blog but, of course, I accidentally missed out a few details — which ended up making the question a bit more interesting. The original question asked the students to identify the lowest molecular mass cyclic alkane (the previous question on the exam had asked about the corresponding acyclic alkane). I don’t really remember how well the class did on the question, but the structure I gave on the exam’s answer key was trans-1,2-dimethylcyclopropane (1). It turns out that this might not — technically speaking — have been the best answer… sorry kids. Well, if you don’t specify ‘alkane’ and you use the word ‘hydrocarbon’ instead, that means unsaturated systems are fair game — and this means that there are better answers than 1. There seem to be four fairly reasonable isomers of C5H8 that fit the bill — compounds 2–5 below. I was quite happy with this set of answers until a few clever people on Twitter suggested some others. @MatToddChem came up with the bicyclobutane structure (6), although this does violate Bredt’s rule. Then @zhorakovsky followed up with the bicyclopentane (7) and bicyclopentene (8) compounds — but these structures are probably far too strained to exist with those trans-fused ring junctions. Finally, @stephengdavey pointed out that 1,2-cyclobutadiene (9) would also be a valid answer, if it existed. So, while all of these answers are OK on paper, the blue ones are much more likely to exist than the red ones. Nevertheless, from what seems to be a very simple question, you can start thinking about structure, bonding, isomerism, stereochemistry, and strain. And if it floats your boat*, nomenclature too (*it doesn’t mine, and this might be the topic of a future post). And that bit above where I mentioned not giving the correct answer on the original exam? Well, that bicyclopentane structure (7) is definitely an alkane and has a lower molecular mass than the trans-dimethylcyclopropane (1)… in my defence, however, 7 probably doesn’t exist. Thanks to everyone else who suggested answers on Twitter or in the comments of the original post! This entry was posted in Fun, Quiz time! and tagged bonding, chemical structures, chemistry, chirality, exam questions, hydrocarbons, isomerism, stereochemistry, twitter. Bookmark the permalink. 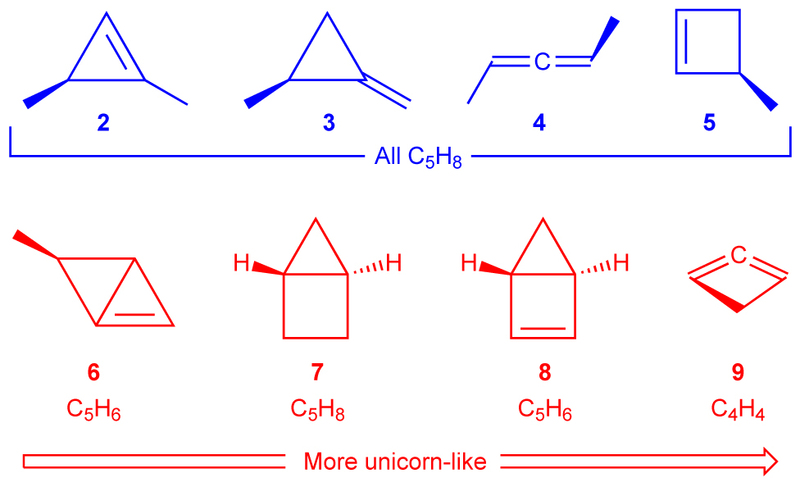 14 Responses to The smallest chiral hydrocarbon? Love it, though I would probably give this one to the kiddos on a homework rather than a test. If you were to give it on an exam, there’d be no end to the complaints from students. Yes, I gave it to my 3rd year undergrad class in the 40-minute-in nap doldrums and they got 1, 3 and 5 in a few minutes of group effort. It’s a great question. I drew 6 up on the board and explained Bredt’s rule. In response, one student drew a kite string on it and some wind effects. You can always count them, but how do you find which is the most stable? Are there some rules or does one have to do calculations? Well, the only way to be sure would be to do some calculations – but I don’t know what flavour as I know next to nothing about computational chemistry. The blue structures are definitely more stable than the red, and I imagine the cyclobutene is more stable than the cyclopropenes — I don’t know how the allene fits in though. As for the red structures, I imagine the strain increases very much from left to right, although I’m not 100% sure about where structure 6 fits in. Great question. I could try out some calculations on the structures. 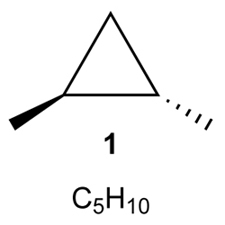 Hey, demethylated 6 is also chiral because of different possible orientations of bridgehead hydrogen. So it’s the same MW as 9! Good spot! So that’s another to add to the list… when will it end?! And compound 7 does indeed exist. At least almost. Look up CAS# 96442-65-8 (racemate) 60426-74-6 (enantiomer) in SciFinder. Deuterium analogs of said compound, 12 literature references in total. Hmm, don’t have access to SciFinder… but really, a trans-3,4-ring junction?! Are they just theoretical studies? The strain on (9) makes my head hurt. I thought of cyclobutadiene (the 1,3 isomer) but then realized that it not supposed to exist, being anti-aromatic and all… though I have to wonder if it’s more likely to exist than (9)? And of course… I just realized I’m an idiot… the question was about chiral compounds, and 1,3-cyclobutadiene isn’t. Oops. If you remove the requirement for it to be a hydrocarbon, are there lighter stable solutions? Realistically, probably 2-methyl-2H-azirine (mw 55). 2-Boryl-2H-azirine is smaller, but probably not monomeric.